F.lux changes your computer display’s color temperature according to location and time of day. It was designed to reduce eye strain during night-time use and disruption of sleep patterns. The f.lux for Linux is a command line daemon and the GUI is an indicator applet created by Kilian Valkhof. Though Kilian’s repository does not update anymore, you can still get the applet for Ubuntu 16.04, and Ubuntu 15.10 via below steps. 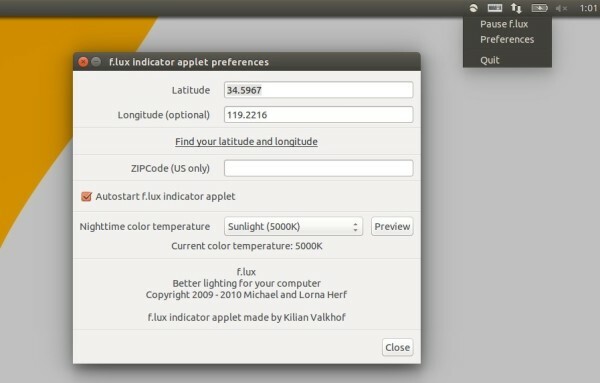 The Linux f.lux GUI is now available in Nathan Rennie-Waldock’s PPA for all current Ubuntu releases. Type in your password when it asks (no visual feedback when typing) and hit Enter to continue. The PPA repository can be removed by going to Software & Updates -> Other Software. Redshift is a great display’s color temperature switcher. In my opinion, redshift is better than flux. Thank you for your suggestion. Easier to install and update since it is in the software center. I just installed f.lux on ubuntu 16.04 via ppa. When i start it the screen color for the night is ok. But then it change step by step to the day mode. Thanks for providing this package! i was looking for f.lux for ubuntu. I like the various options like Tungsten, Sunrise/Sunset, Matchstick to adjust how dim you like the screen. Instructions also work for Linux Mint 18.1 (Cinnamon). Many Thanks!! Thanks — works on Linux Mint 13 MATE as well.